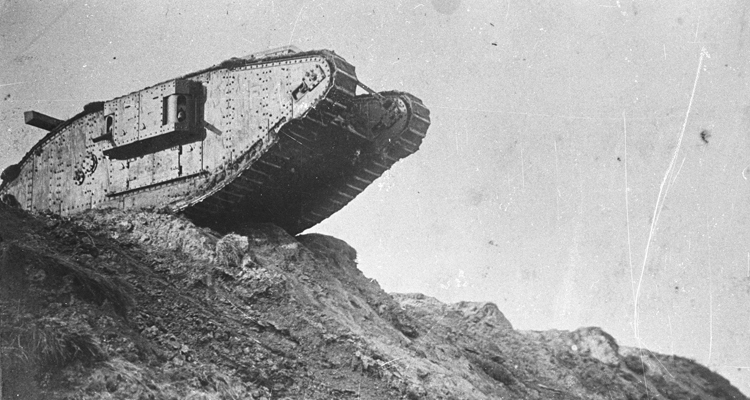 This series of posts reproduce a selection of entries from this month, giving us an idea of how tank crewmen prepared for their greatest challenge yet. 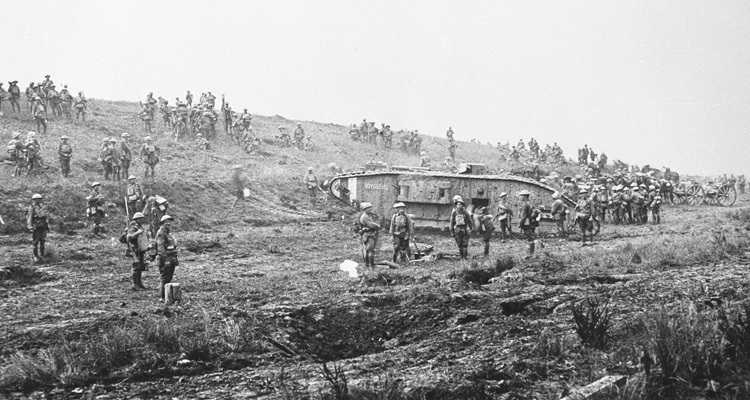 Find out about the origins of the Battle of Cambrai here. During this week the battalions of the Tank Corps are mostly in the countryside around Arras, with Wailly as their main training ground. Battalions record training with fascines for crossing trenches and grappling hooks for clearing barbed wire. They also work with the infantry units they will support, as well as conducting routine maintenance on their tanks. 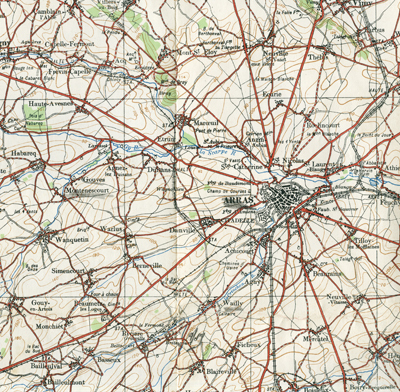 Wailly and Montenescourt shown in relation to Arras, the nearest city. A Battalion: Wailly. Map Sheet 51 SE: R.22.b. New tanks arrived to complete Battalion establishment. B Battalion: Wailly. Routine. Number 5 Company fascine tests over old trenches. Successful in all cases except on trench 21ft wide, 10ft deep. C Battalion: All crews working on tanks, preparing them as if for action. Nearly all deficiencies made up, except for unditching gear. D Battalion: Wailly. Strength of Battalion: Officers 84; ORs 807. On this date Major J Bingham Commanding Officer 10 Company and Officer Commanding special detachment with 2 officers and 15 ORs were struck off strength of D Battalion and posted to Home Establishment. A/Capt T McLuskie took over duties as Brigade EO and Lt E Chambers was appointed Battalion EO. E Battalion: The Adjutant and the remainder of Battalion HQ left for Wailly. 2/Lt H M M Claughton reported for duty. F Battalion: Auchy-lès-Hesdin. Work was continued on the tanks, sprockets etc being changed where necessary & they were thoroughly overhauled ready for training exercises with infantry in the near future. Any men available were bathed at BLANGY. G Battalion: Arras. Battalion Reconnaissance Officer visits scene of future operations with Brigade RO. Were instructed to drive all tanks as much as possible for the next week. H Battalion: 22 Company at railhead (Montenescourt) and commenced march to Blavincourt. 23 Company entrained at Ouderdom. I Battalion: 25 Company left Beaumetz at 3 p.m. 26 Company left Beaumetz at 6 p.m. 27 Company left Beaumetz at 9 p.m.
E Battalion: Reconnaissance Officers proceeded to Havrincourt Wood on reconnaissance work. G Battalion: Nothing of importance to record. H Battalion: 23 Company arrived Montenescourt and commenced march to Blavincourt. 24 Company entrained at Ouderdom. Six new tanks taken on strength of Battalion from Central Workshop. C Battalion: 3 Companies move to Bray-sur-Somme. Times of trains were as follows:- No 8 Company, 3 pm; No 7 Company, 6 pm; No 9 Company, 9 pm. All trains were loaded and ready to proceed by times stated. Each train was several hours late in moving off from Central Workshops. E Battalion: The CO attended 51 Division conference. G Battalion: Practice with infantry. 21 Company (12 tanks) work with Battalion of KOYLI of 62nd Division. Prepared ground for tomorrow. I Battalion: 12.15 am; Tanks of 26 Company arrived at Plateau Station and arrived at Tankodrome between 3.30 and 6 a.m. 12.30 a.m. Personnel of 27 Company arrived at Plateau Station and arrived at Tankodrome between 3.30 and 6 a.m. 3 a.m. Tanks of 27 Company arrived at Plateau Station and arrived at Tankodrome between 3.30 and 6 a.m.
A Battalion: Practices of Co-operation of tanks with infantry. 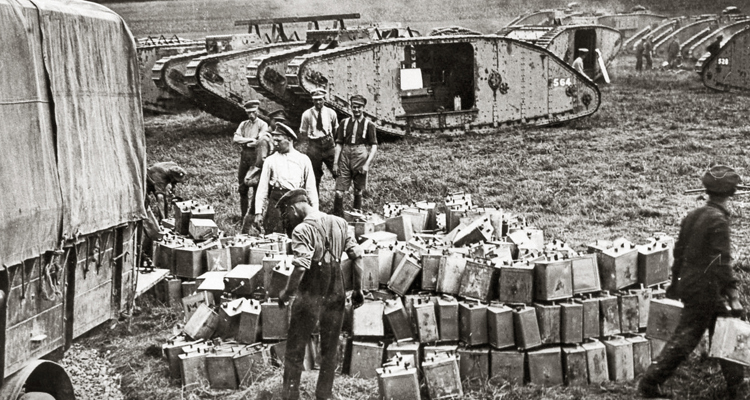 Preparation of tanks for action. No 1 & 2 Companies move tanks to railhead. B Battalion: Church parade. Routine. No 5 Company – special demonstration with infantry at Mercatel, crossing of trench with fascines. Successfully carried out by tanks 8040, 2080, 2869, 2874, 2872. E Battalion: Demonstration in the use of fascines held at Wailly. 2/Lt Austin, 2/Lt Walker reported for duty from “G” Battalion. G Battalion: B Battalion held practice with fascines S of MERCATEL. 1st Brigade conference in the evening. 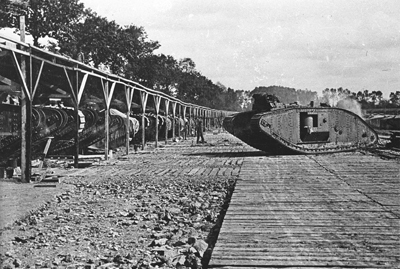 The tankodrome at Rollancourt, near Auchy-lès-Hesdin. D Battalion: Strength of Battalion: officers 89; ORs 807. 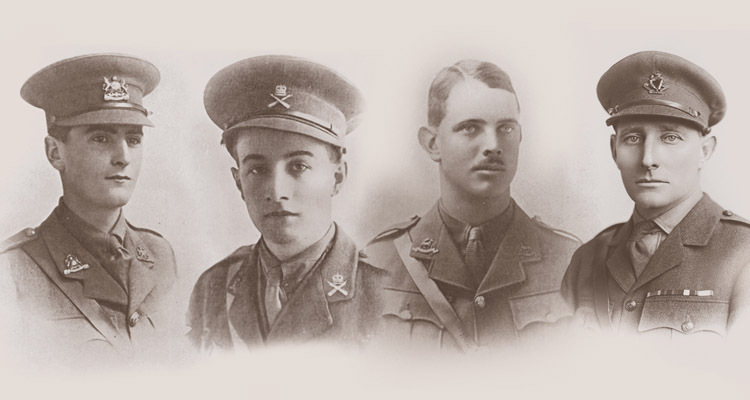 On 6th Lt Paulet King rejoined 14th Gloucesters Regt and struck off strength of Battalion. E Battalion: 2/Lt T Johnston reported for duty from “G” Battalion. Officers of 14 Company attended lecture at GOC 152nd Brigade at Dainville. G Battalion: 19 and 21 Companies practice with two Battalions of 187 Infantry Brigade on 1,200yd front. Timetable of moves to forward area received. B Battalion: Routine. 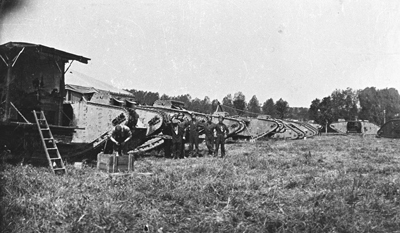 No 6 Company send two crews to Central Workshops to draw two tanks. C Battalion: Tankodrome and camp construction continue. Major Johnson DSO visits Tankodrome for demonstration in correct manner of fastening fascines. On the night 7/8th 2 supply tanks and 4 wire-pullers arrived. Supply tank crews and Officers of other Battalions being rationed by C Battalion. Weather – wet. F Battalion: Training in attack and wire pulling was practised with the 12th Division by each company in turn. 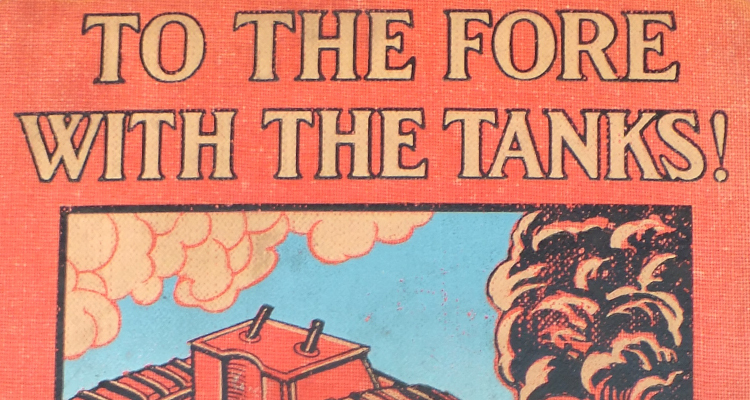 Men not so employed continued work on tanks & practised employment of a new type of fascine which has been issued to aid tanks in crossing extra wide trenches. I Battalion: Training under company arrangements. 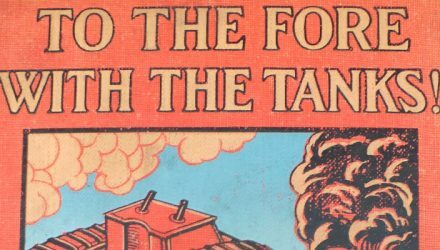 Read The Tank Corps War Diaries for 7 – 12 November 1917, as preparations continue.